In the heart of downtown Orlando, FL, right where Thornton Park meets the Central Business District, lies the fun, beautiful Lake Eola Park. It's a great place to spend an afternoon with or without the kids, and it's an ideal way to experience the soul of downtown Orlando. Consider combining a visit with the Downtown Orlando Historic District Walking Tour to get a good look at the area. The park lies near the edge of 200 acres of land purchased by Jacob Summerlin, a cattle rancher and major figure in Central Florida history, in 1873. Not long after he bought the land, Lake Eola formed as a sinkhole reaching almost 24 feet deep that filled with water because of a natural aquifer 200 feet below and the addition of rainwater. The lakefront became known as Sandy Beach, and area settlers often enjoyed cooling off there. In 1883, Summerlin donated the land for public use and it was renamed Lake Eola after his deceased girlfriend. In 1888, it became an official City of Orlando public park. Today, many wading birds, waterfowl, turtles and other wildlife can be seen at the lake, including the most famous residents, the swans, whose population dates back to 1922. Today, there are several swan species living at Lake Eola: trumpeter swans, black-neck swans, whooper swans, royal mute swans and Australian black swans. Visitors can buy special approved food to feed these graceful birds from feeders found around the lake. Near the center of the lake is one of Orlando's most famous icons, the Linton E. Allen Memorial Fountain. This tiered art deco-style fountain was built in 1957 and refurbished in 2011. Its shooting water is synced at night with a music and light show. The lake is encircled by a scenic walking path almost 1 mile long. Along the way, there are a number of sites of interest, as well as plenty of natural beauty and wildlife. The historic Eola House dates back to 1924. This Mediterranean Revival-style home now houses the park offices and is open to the public daily from 11:00 am to 6:00 pm. It has not been renovated or updated, so it is not entirely ADA compliant, and the second floor is not wheelchair accessible. Close to the Eola House is a large, unique playground, with separate areas for smaller children and for older kids, as well as picnic tables. In 1911, the United Daughters of the Confederacy presented the Confederate Monument to the City of Orlando, and it was moved to Lake Eola Park in 1917. There's also a Battle of the Bulge monument honoring World War II veterans dedicated on December 16, 1999. Visitors also enjoy the Chinese Ting, a large pagoda, originally built in Shanghai but disassembled for transport and reassembled at the lake. Nearby is a Japanese rock garden featuring a 19.5-foot long, 12.5-ton slab of black marble gifted to the City of Orlando by Su Nan-Cheng, former Mayor of Tainan, Taiwan. The octagonal Sperry Fountain isn't as famous as the fountain in the center of the lake, but it's an artistic addition to the park featuring a wrought iron figure with a large acanthus leaf and ducks at the base. It and its land, which includes a serene seating area, were presented to the City of Orlando in 1914 by former Mayor E. Frank Sperry. The so-called “band shell,” now known as the Walt Disney Amphitheater, has been a feature of the park since 1886. However, the original was torn down and a new one built on the west side of the lake. There are often free concerts and other live performances here. 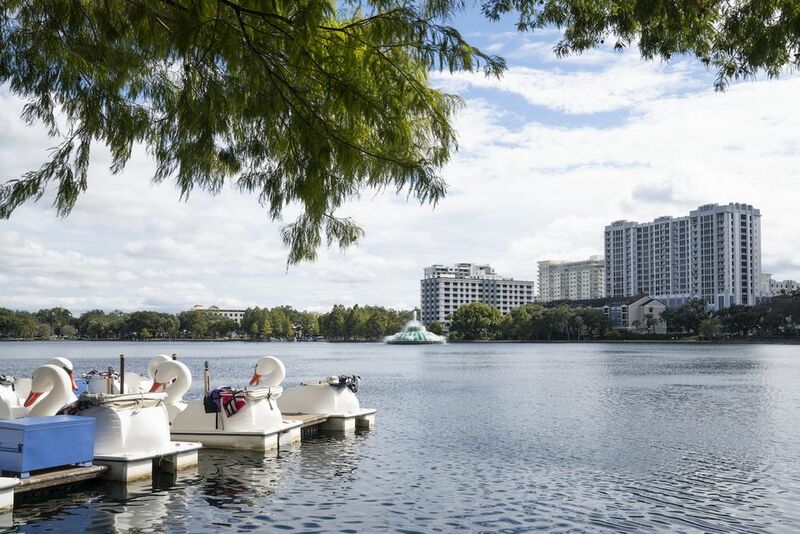 Along with the large playground, scenic walking path and shows at the amphitheater, there are plenty of other ways to enjoy Lake Eola Park. For example, get out on the lake by renting a paddle boat shaped like a swan for $15 per half hour. Each vessel holds five people and children are welcome. The park also regularly hosts a variety of public events, including a number for kids and for dog owners and a massive 4th of July celebration and fireworks show. In addition, Movieola is a free family-friendly outdoor movie series at the park complemented by food vendors and various fun activities; see what's playing on the website. Lake Eola Park is surrounded by shopping, dining and drinking establishments, as well. For lakefront eating and drinking, try the World of Beer Downtown Orlando, Relax Grill at Lake Eola or Spice Modern Steakhouse. Drop by from 10:00 am to 4:00 pm on any Sunday of the year to peruse, shop and eat at the Downtown Orlando Farmer's Market. It features an impressive array of arts and craft, clothing and accessories, beauty products, artisanal food and drinks, produce, and lots more, primarily from local vendors. This downtown tradition has been providing Orlando residents a Sunday morning market since it's opening under I-4 across from the infamous Church Street Station in 1987. Now conveniently located at the picturesque Lake Eola Park near the intersection of Osceola Avenue and Central Blvd., this upscale market is a great place to find fresh produce, delightful treats, handmade items, plants, and jewelry. If you're getting around downtown Orlando on foot, Lake Eola Park and many other destinations of interest are easily accessible on the free, convenient LYMMO bus lines.